NHK, who apparently had a live footage of the scene at Fukushima I Nuclear Power Plant according to people who were watching TV, says it took the truck carrying the cask 10 minutes to go from the Reactor 4 building to the Common Pool which is 100 meters away. At 1PM on November 21, 2013, the first container to transport 22 nuclear fuels taken from the Spent Fuel Pool of Reactor 4 at Fukushima I Nuclear Power Plant was removed from the reactor building, and transported to the storage facility 100 meters away inside the plant compound. 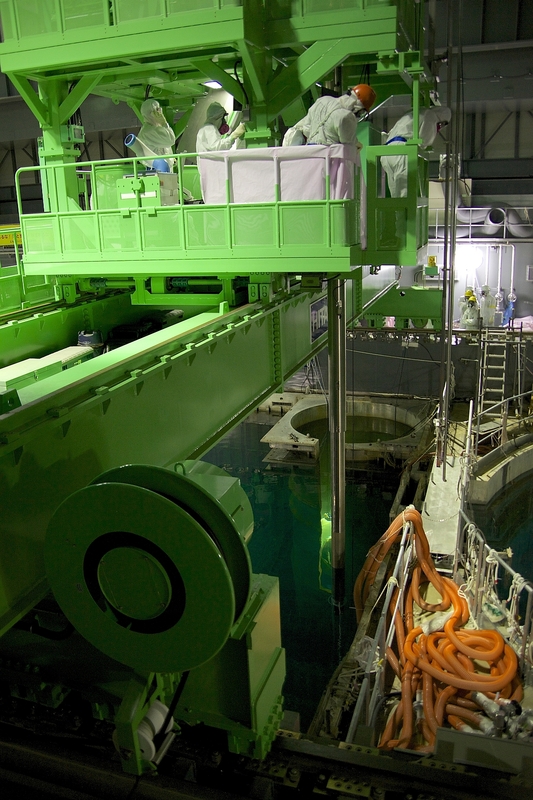 On November 21, the container, called "cask", that has 22 unused, new fuel assemblies was taken out of the Reactor 4 building on a trailer [trailer truck, or rig], and transferred to the facility called the Common Pool in 10 minutes. The trailer was led by a white car, and proceeded at a slow, walking speed while workers looked on. It backed into the Common Pool. This was the first time the container with fuel assemblies was transported out of the Reactor 4 building since the start of the fuel removal work on November 18. According to TEPCO, the Common Pool was evaluated to be able to withstand the earthquake of the same level as the March 11, 2011 earthquake, and fuel assemblies would be more securely stored there than in the Spent Fuel Pool located in the building damaged by the accident. No video or photos yet at TEPCO's Photos and Videos Library. (UPDATE-2) Jiji reports (11/19/2013) that the workers successfully removed 4 unused new fuel assemblies into the cask by 6:45PM. The air dose level near the pool was 0.04 millisievert/hour (or 40 microsieverts/hour). (UPDATE) TEPCO says the workers started lifting the very first fuel assembly at 3:25PM JST. 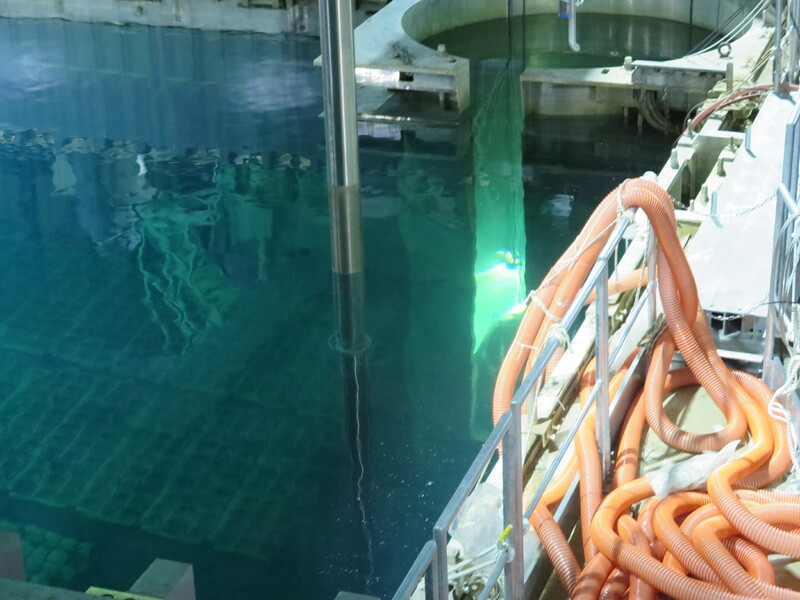 At 3:18PM, TEPCO started to remove the nuclear fuels from the Spent Fuel Pool of Reactor 4 at Fukushima Nuclear Power Plant. On November 18, part of the unused, new fuels will be transferred to the cask, a container for transporting the fuels, in the Spent Fuel Pool. The work uses the fuel handling machine, and will continue until about 7PM. Removal of the fuel assemblies will continue tomorrow (November 19), the cask will be lowered to the ground on November 19. It will take about a week for the first cask to be transported to the Common Pool 100 meters away. 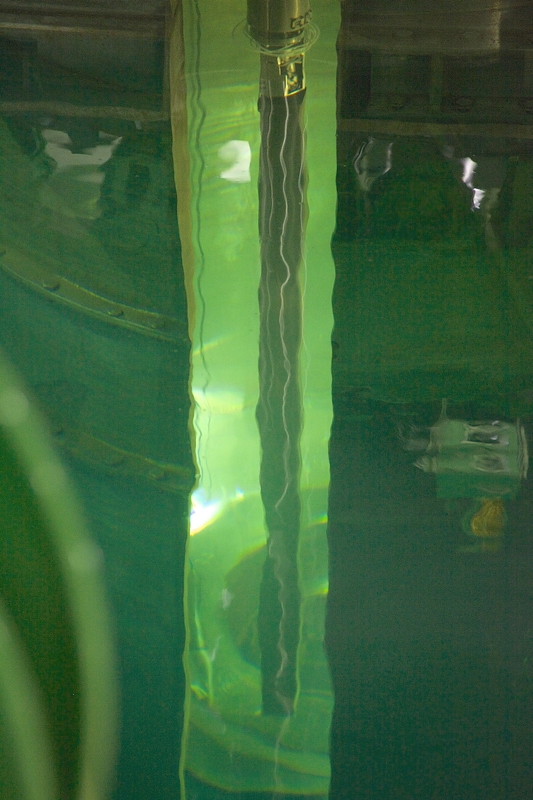 AM: The cask is being submerged into the cask pit. It must be proceeding well so far, as the bright pink headline banner on NHK's homepage (circled in blue below) only says "We will let you know as soon as there is further news." The fuel handling machine is operated by the workers with long experience of handling the nuclear fuel, according to the workers who regularly tweet from Fukushima I NPP. Here's the link to the 7-page summary of the fuel removal operation, from TEPCO (11/13/2013). Just as the independent journalist Ryuichi Kino said previously, "Fuel removal conducted in the daytime, and debris removal at night". After conducting the above actions, we will proceed with fuel removal with “first priority given to safety”, not to achievement of the schedule. Mainichi Shinbun (11/13/2013) says the reactor building cover over the Reactor 4 operating floor was built with 4,200 tons of steel beams, the same amount of steel beams that were used to build Tokyo Tower. If I remember right, the design and construction was by Kajima. It was designed and built so that the weight of the heavy cover would not be borne by the original reactor building.